How a propaganda goof by Richard Nixon’s administration midwifed an urban legend that scarred American foreign policy and domestic politics for a generation. Yesterday came news that my home state, Illinois, is preparing for its twenty-sixth annual ceremony this Saturday to honor the “66 Illinoisans listed as MIA or POW in Southeast Asia.” I absorbed this development the same week I had occasion to attend an internment at a military cemetery in Washington State, over which flew, alongside the banners of all of America’s military service branches, the familiar “POW/MIA” flag with the forlorn, hangdog prisoner silhouetted in the foreground and guard tower and barbed wire in the back. Given the scale of national problems we’re facing these days, this one hardly registers a dent. But it creeps me out all the same. And if you deplore jingoistic, racist propaganda, it should creep you out, too—so, this afternoon, let me unburden myself. During the Johnson years, Sybil Stockdale, whose husband James (Ross Perot’s unfortunate running mate in 1992) was the highest-ranking and one of the earliest POWs, had organized a “League of Wives of American Prisoners of War” (later the National League of Families of Prisoners of War, then the League of Families of American Prisoners and Missing in Southeast Asia) which agitated for attention to the prisoners’ plight—against the Pentagon’s wishes. Under Nixon, the Pentagon co-opted it, sometimes inventing chapters outright, as useful to their propaganda barrage. Their families showed up on newsmagazines and TV; “POW bracelets,” invented by the future wingnut congressman “B-1 Bob” Dornan, then a local Limbaugh on Orange County radio, were unveiled in the spring of 1970 at an annual “Salute to the Military” ball in Los Angeles. (Governor Ronald Wilson Reagan presided, and Hollywood choreographer Leroy Prinz, who had worked with Reagan on the 1942 film Hollywood Canteen, choreographed a splendid pageant.) Bracelets soon sold at a rate of 10,000 a day; Sonny & Cher wore them on TV; some people, the The New York Times reported, believed them to “possess medicinal powers”―and not just the children who displayed them two, ten, a dozen to an arm. A Wimbledon champ said one cured his tennis elbow. Lee Trevino said his saved his golf game. Matchbooks, lapel pins, billboards, T-shirts and bumper stickers (POWs never have a nice day!) 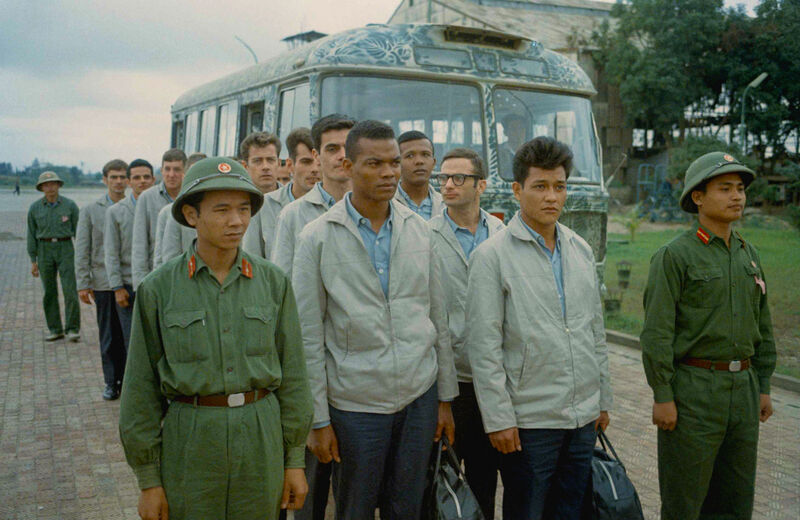 proliferated, fighter jets made thunderous football stadium fly-bys, full page ads blossomed in every newspaper urging Hanoi to have a heart and release the prisoners for the sake of the children. This is when the story got even nuttier—when the propaganda slipped the bounds intended by its authors, and became more like the brooms in The Sorcerer’s Apprentice. The scholar H. Bruce Franklin of Rutgers tells the story with elegant economy in the book M.I.A., Or Mythmaking in America; Northwestern’s Michael Allen tells the story in more detail in Until the Last Man Comes Home: POWs, MIAs, and America’s Unending Vietnam War. Henceforth paying ritual obeisance, hat in hand, at meetings of the League of Families of American Prisoners and Missing in Southeast Asia became presidents’ annual ordeal. Read the section in Allen’s book about George H.W. Bush’s manhandling at the 1992 conclave. Read here about how Nixon’s long-lived propaganda goof delayed normalization of relations with Vietnam until 1995. And click here to see how this absurd cult still endures. The 9/11 Truthers don’t enjoy official government sanction. But if you happen to live in Illinois, you can roll with your very own “POW/MIA Illinois Remembers” license plate for your car. The “66 Illinoisans” apparently still imprisoned in Southeast Asia hardly deserve less. Rick Perlstein questions whether John F. Kennedy would have ended the Vietnam War.